“Generations – Creations” is the Foundation’s educational project that brings together children from orphanages and seniors from third age universities. There have already been organized two editions of the project in four Polish towns. The third edition is being implemented in 2012. As part of the project, adults and children attend concerts, art exhibitions and theatre performances. At the second stage, they participate together in art, music and drama workshops. Finally, the groups of children and adults prepare their own theatre performances and art exhibitions. 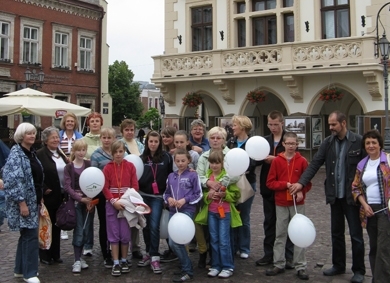 So far, groups of co-operating youngsters and seniors have been formed in four Polish cities – Łodź, Zamość, Świdnik, Przemyśl. The project entails numerous positive effects. It creates a strong intergenerational bond between younger and older participants, stimulates their cultural interests, helps to discover artistic talents and recognize a new valuable way of spending free time. Moreover, culture centers have decided to enrich their cultural offer for common creative way of spending free time, adding activities similar to those encouraged by the project for grandparents with grandchildren. Discovering new fields of leisure activity by the elderly is also a very important outcome of the project. The elderly are often excellent at passing on values and traditions to youngsters. They become important adults whom the children can look up to, especially if they have such role models missing from their lives. The children from orphanages are acquainted with different life attitudes than they happen to know from their families, which are very often dysfunctional or pathological. Implementation of the project enabled to develop the model which can be introduced on a local level in Poland. The aims of the project are perfectly linked with the goals of the European Year for Active Ageing and Solidarity between Generations (2012) which encourages people over 50 to volunteering. The initiator and co-ordinator of the project is Elzbieta Olszewska, Foundation’s Program Director. For more information about the project, please contact us via mail: europe@cpcd.pl or at telephone number +48 22 648 38 91. The final performances of the second edition took place in December 2011. 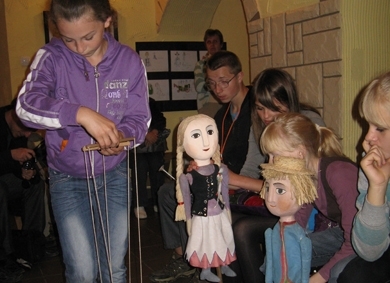 In Przemyśl it was a figure theatre with the use of the multimedia „Teddy Bears on a tour of Przemyśl”, in Łódź - performance "Dreams”, based on the comic about children’s and seniors’ dreams, in Zamość play „The Snow Queen” with the use of dolls prepared by the participants. 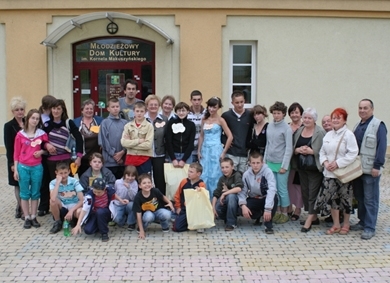 Integration classes as part of the project in Przemyśl and in Zamość. Training for the elderly from the University of the Third Age in Zamość.